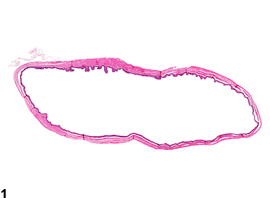 Dilation of the urinary bladder with focal to diffuse flattening of urothelium, from a male B6C3F1 mouse in a chronic study. Normal bladder for comparison, from a male B6C3F1 mouse in a subchronic study. 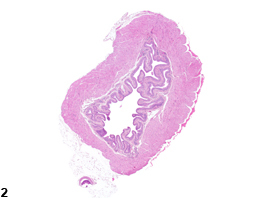 Dilation of the urinary bladder is characterized by an overly distended bladder with flattened urothelium ( Figure 1 ). This is a commonly observed change, which can result from a number of etiologies. The most common cause is obstruction. Cases of urinary bladder dilation may be noted where the cause is not apparent or related to chemical administration. The etiology of bladder dilation may be missed when the urethra is not examined. Mouse urologic syndrome in male animals is a frequent cause of obstruction, bladder dilation, inflammation, morbidity, and death. Calculi may also block the outflow of urine, leading to dilation. Although proteinaceous plugs may be observed in the trigone region of the urinary bladder, these plugs usually do not contribute to dilation because in most cases they represent agonal events. 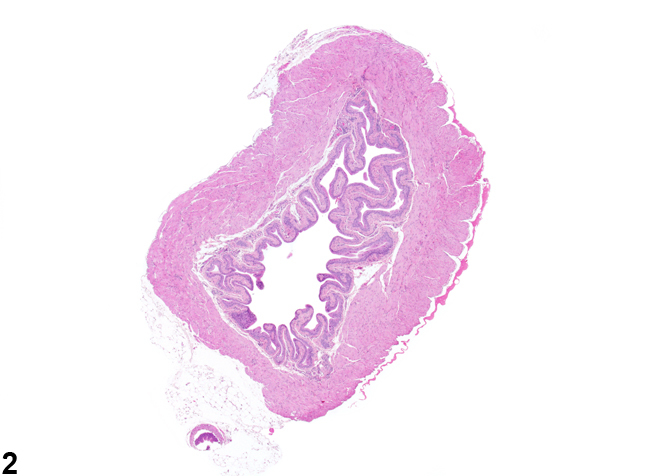 Formalin inflation of the urinary bladder is usually recommended, but overinflation and other inflation-related artifacts may occur. Dilation of the urinary bladder should be diagnosed and given a severity grade. Identification of cause should be considered if dilation is treatment related. If the cause can be identified, it should be diagnosed separately and its relationship to the urinary bladder dilation discussed in the narrative. Babcock VI, Southam CM. 1965. Obstructive uropathy in laboratory mice. Proc Soc Exp Biol Med 120:580-581. Collins GR, Goodheart CR, Henson D. 1972. Spontaneous heritable hydronephrosis in inbred mice. 1. Description, incidence, and distribution of lesions. Lab Anim Sci 22:333-338. Everitt JI, Ross PW, Davis TW. 1988. Urologic syndrome associated with wire caging in AKR mice. Lab Anim Sci 38:609-611. Hsu HH. 1986. Hereditary hydronephrosis, mouse. In: Monographs on Pathology of Laboratory Animals: Urinary System (Jones TC, Hard GC, Mohr U, eds). Springer, Berlin, 273-275. Maronpot RR. 1998. Spontaneous hydronephrosis, rat. In: Monographs on Pathology of Laboratory Animals: Urinary System, 2nd ed (Jones TC, Hard GC, Mohr U, eds). Springer, Berlin, 306-309. Sokoloff L, Barile MF. 1962. Obstructive genitourinary disease in male STR/1N mice. Am J Pathol 41:233-246. Weide LG, Lacy PE. 1991. Hereditary hydronephrosis in C57BL/KsJ mice. Lab Anim Sci 41:415-418.